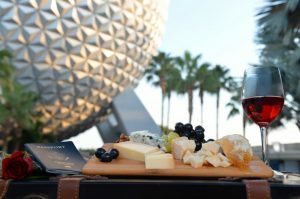 The 2016 Epcot Food and Wine Festival starts September 14 this year and we have some exciting news and details about the event. This year’s Marketplace Booths will feature old favorites, a couple new additions, and the return of the Islands of the Caribbean booth! New booths for this year include The Chew Collective, the Chocolate Studios, and the Wine & Dine Studio. For a full list of booths and menus visit the Disney Food Blog’s 2016 Epcot Food and Wine Festival Booth page! The cast of ABC’s The Chew is returning to the festival this year and they’ll be taping shows during the week of October 5-7. Special events during this year’s Festival include the Party for the Senses; the Rockin’ Burger Block Party; Mix It!, Make It!, Celebrate It! workshops; the new Brunch with a Twist at Disney’s Grand Floridian; and a Behind the Scenes look at Trader Sam’s. Booking for all special events this year opens July 21. Beverage seminars will take place each day during the Festival at 1, 3, and 5:30 p.m. and they cost $15. Culinary demos take place daily at 12 and 2 p.m. and also cost $15. The Eat to the Beat concerts are also returning this year and guests will once again be able to book and Eat to the Beat dining package which includes a meal at a participating Epcot restaurant and reserved seating at that night’s concert. The 2016 Epcot Food and Wine Festival kicks off September 14 and runs through November 14. To find the most up-to-date information on the Festival visit the Disney Food Blog’s 2016 Epcot Food and Wine Festival page. This entry was posted on Wednesday, July 6th, 2016 at 10:00 am	and is filed under Planning, Theme Parks, Tickets, Touring Plans. You can follow any responses to this entry through the RSS 2.0 feed. You can leave a response, or trackback from your own site.